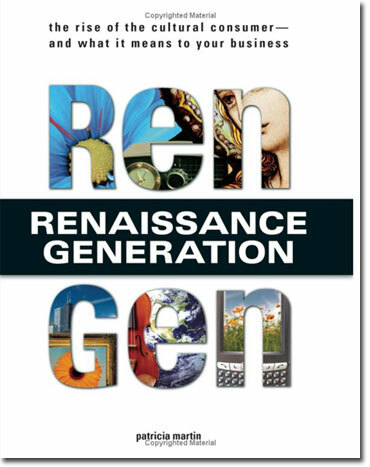 It is happening in our cities now, and it rivals the Renaissance of the 1300s, according to author Patricia Martin in her new book, Rengen: The Rise of the Cultural Consumer – and What It Means to Your Business. Who are the Rengens? Patricia says it’s more of a mindset than a specific demographic – “a thirty year swath of individuals who are living comtemporaneously”, fueled by a large group of boomers and a very large group of 16-28 year olds. Why is there a renaissance happening now? At the same time there’s a universal sense that we’re in an unprecedented decline (uncontrolled population growth, global warming), we’re experience a monumental technological shift (ie the web, internet). What is the Rengen aesthetic? A look and feel based on the natural world, with a preference for imperfection in order to have something more authentic and ecologically sound, such as the gnarly biodegradable flower pot over the perfect green plastic one, or historic buildings vs brand new steel and glass versions. What is the Rengen spirituality? It’s about ‘fusion’, a diverse coming together, a mashup, of differences in arts, culture, ethnicities and incomes, not segregated and divided. – Green cities – probably an expression of the above. Among the author’s list of Rengen cities: Chicago; Providence, RI; Philadelphia; and Seattle – the latter of which she describes as overflowing with ambition, founded by entrepreneurs, though constrained by bureaucratic government. She leaves out New York – too expensive – though by sheer density alone there are enough creatives who find a way to still live there that I believe it’s still a Rengen city. One key takeaway from the author: The average consumer wants to be marketed to as being bright and creative. Indulge them. You can catch more of Patricia in her Smart City Radio interview.